Photograph 1 - Our dear Allison loved rainbows. We thought that this may be a message from her. 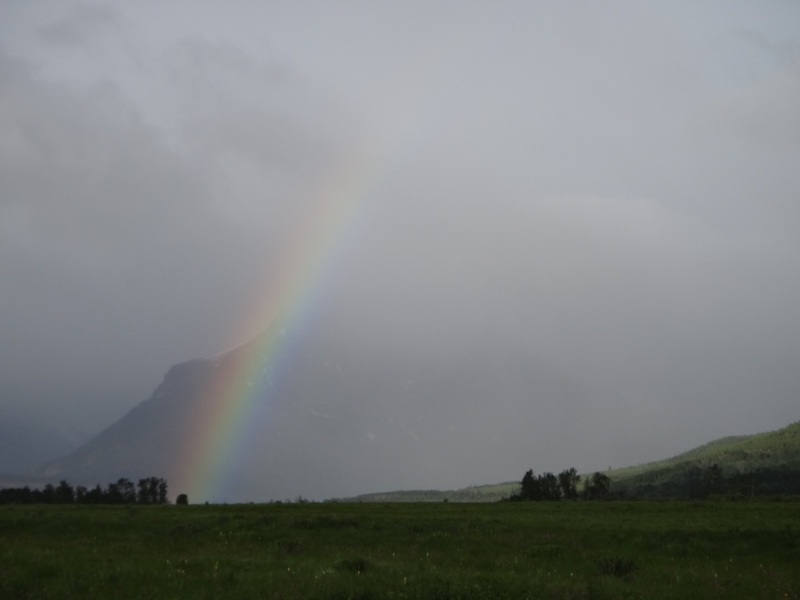 Taken at St Mary, Montana just as we were leaving our accommodation at 7:15am The image at the left of the rainbow is the slope of the mountain, the rest is covered with cloud. Photograph 2 - As we were crossing Logan Pass the temperature was 0 decC. There was sleet but coming down on the other side it was wet and miserable. 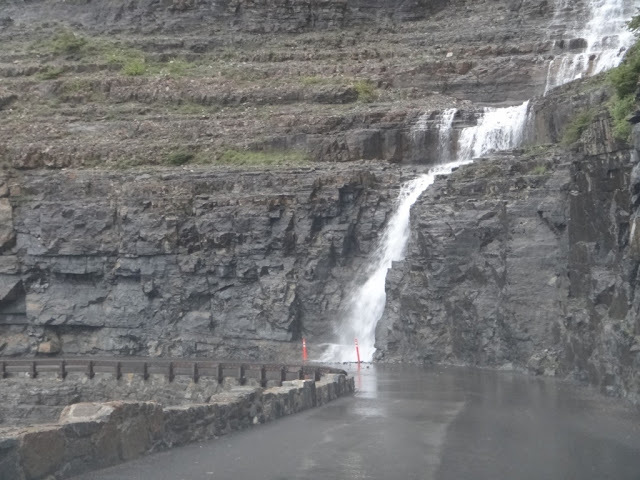 This is one of the many waterfalls from melting snow along the Going-to-the-Sun Road, Montana. 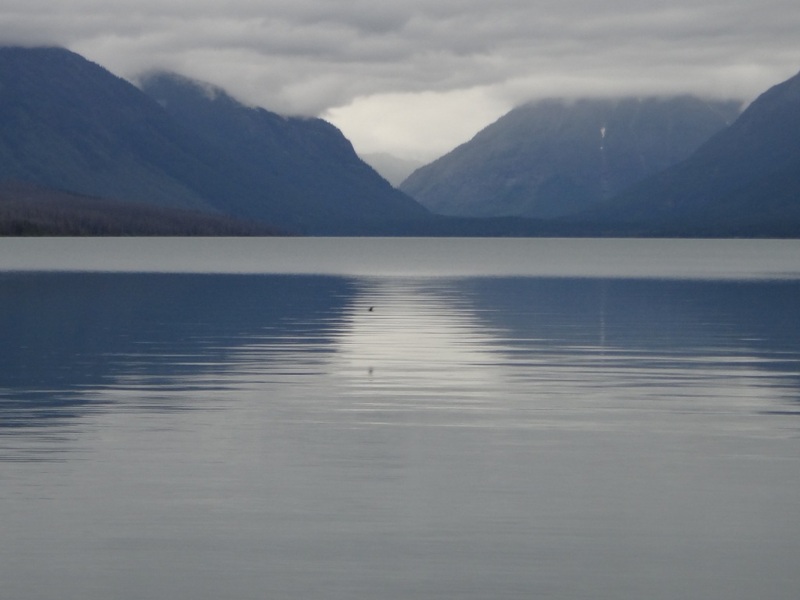 Photograph 3 - A view of Lake MacDonald, West Entrance to the Glacier National Park, Montana. The weather was improving but still overcast. We actually came through the v-shaped valley in the centre of the picture. Photograph 4 - Our accommodation in Spokane, Washington state. Doesn't the Davenport look like a Commonwealth Bank money box? 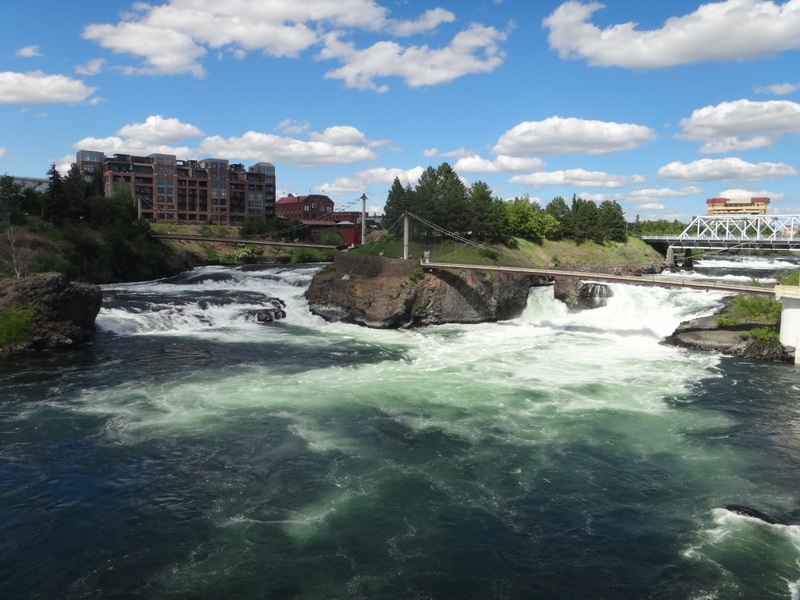 Photograph 5 - The Spokane River flowing through the centre of the city - a miniature Niagara Falls. Photograph 6 - Anne enjoying the stroll across the Spokane River Falls suspension bridge. 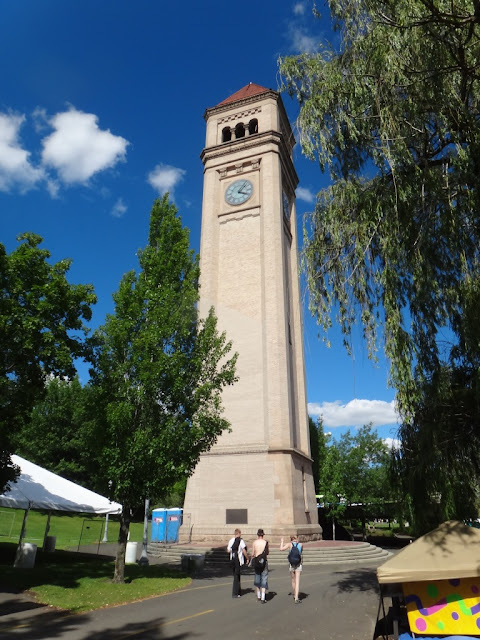 Photograph 7 - The icon of Spokane, Washington - the Clock Tower. 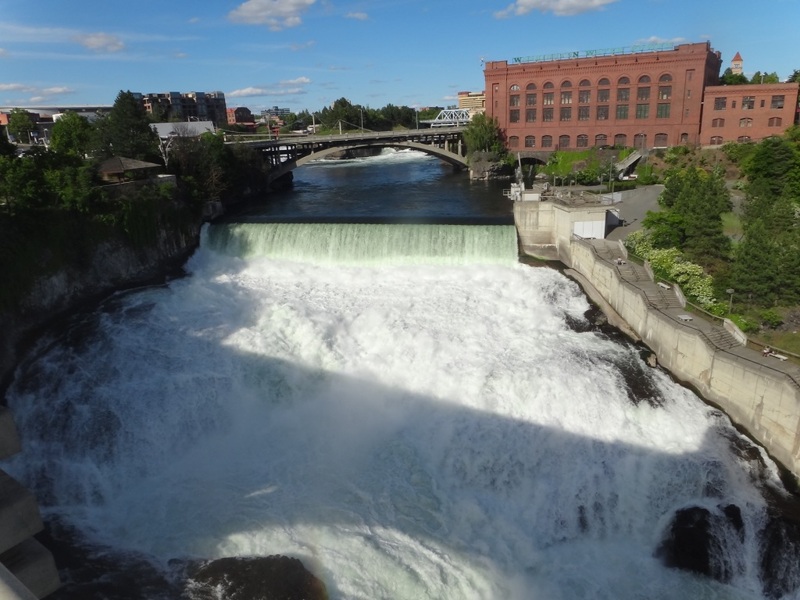 Photograph 8 - Spokane has three waterfalls, this one is near the Monroe Street Bridge. The amount and flow of water is awesome. Well, at last we are on Wifi again. We made it to Spokane in Washington state after leaving a wet and miserable St Mary, Montana. It didn't worry us yesterday as it was a rest day but today the climb over Logan Pass westward was a hair-raising experience. We left at 7:15am and saw a great rainbow as we left St Mary. We thought that this was a message from Allison who is guiding our way. But....at Logan Pass there was sleet and the rangers had the snow-plow out moving broken pieces of snow and water off the road. We were worried about black-ice. Descending down from Logan Pass was not fun either. The road is so narrow and they were doing road works! Nevertheless at the bottom we entered the Pacific side of the Continental Divide and the weather improved. We drove to Spokane in Washington state passing through the Panhandle of Idaho. Interesting the east to west journey across Idaho was only about 150 klms or so - it did not take us long. We felt like Forest Gump running across the states in all directions. We arrived at Spokane to a warm and beautiful weather at 3pm. Settled in to the Davenport Hotel in the centre of the city. To reach the Davenport we experienced so many traffic lights that it reminded us of Mulgoa Road in Penrith. 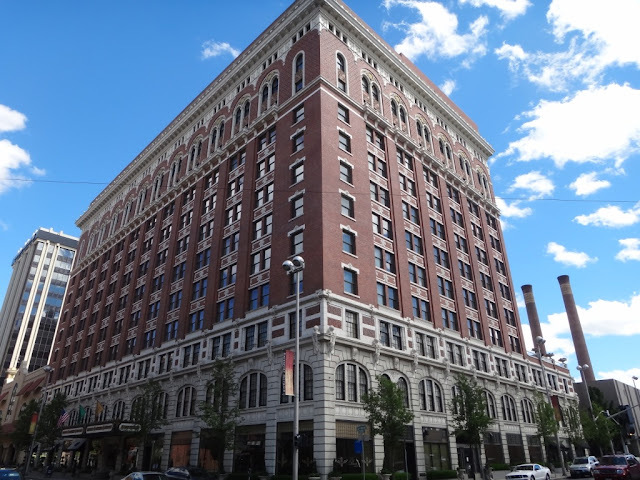 As a city Spokane retains its old buildings, the bulk look like Commonwealth Bank money boxes. There is nary a skyscraper here....and they boast they are the biggest city between Seattle and Minneapolis! We discovered that Spokane is Bing Crosby's (not his birthplace) home town. 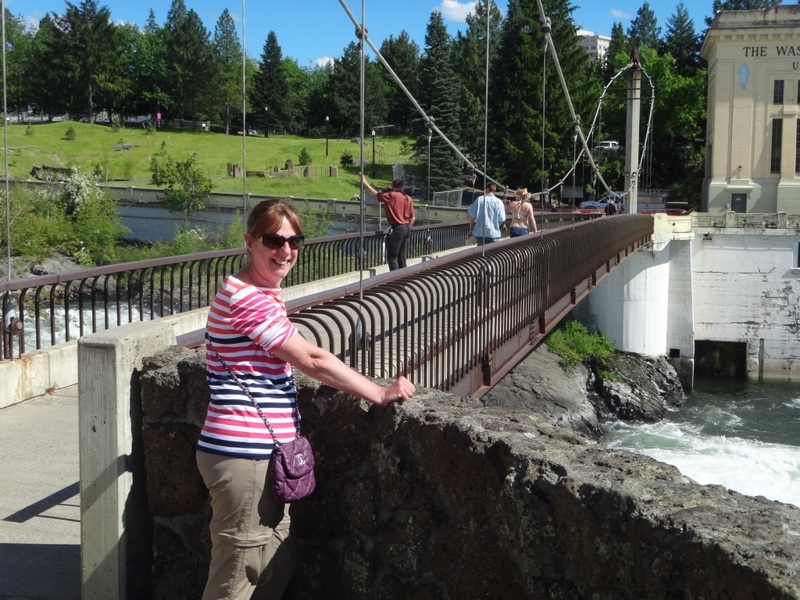 We had some time and walked around the waterfall area of Spokane - a tremendous river flows through the centre with three waterfalls to give the onlooker a taste of Rocky Mountain hospitality. Anne found another Macy's during our walk and bought some more clothes. This time two tops (I think that what she called them) were only $5USD each! We have a five to six hour drive to Seattle tomorrow and now feeling that our holiday is on its final leg. So untiltomorrowcheers. PS: We forget to mentioned about our non-alcoholic day yesterday. Apparently the Blackfeet Indian tribe were having their election day yesterday. Therefore no alcohol was sold in the Indian Reservation and National Park. The nearest drinking-hole was in Canada or 140klms away in Montana. Many people were not happy in St Mary, Montana last night.........we did had a supply of firewater in our fridge but we never told anybody....shhhhhhhhh!